I'm hoping you guys can help steer me in the right direction. I bought 5 pre cut pots from Brookside, (good experience), with 5 different surfaces. For Pots I have, Ziricote, Mahogany, Purple Heart, Zebra wood, and Padauk. Striker surfaces are Aluminum, Etched Glass, Copper, Slate, and Slate. Sound Boards are Glass x3, Slate, and Cedar. I intend to do Aluminum over glass, Glass over Glass, Copper over Cedar, Slate over slate and Slate over glass. I also bought a variety pack of strikers so I could play with different sounds on the different combos to see what sounds good to me. 1. Any recommendations as to to which surface combo to match up with which pot? 2. I sanded all 5 pots to 600 on the drill press with a bolt jig I made, they are all pretty slick now. I have Teak oil, and have read that I should do a 'soak' of the oil for 30 min- 24hr let it dry and then buff to awesome. How do you guys do your soaks? pour Teak or Tung or Tru or velvit etc... into a glass brownie pan and let it soak that way? I am curious. I can't soak inside, I have a fire lit 23hrs a day... it'll warm up before long though.. I figure I will just wipe the teak oil onto the strikers (minus the tip inch). I have plumbers goop in the cabinet already so set there as well. Any thoughts would be most welcome, looking forward to using these with my nephews for their first hunts this spring. Thanks in advance, and thanks for the awesome tutorial section that made me start with these pots instead of ordering some for the kids. I have made a few Glass over Glass pots out of Paduak. Loudest calls I have ever made. Dont know if its just me, but that combination gives me the best volume, if at a little higher pitch. Try your slate over slate on the purpleheart. another good combinations. Thank you, its a start. I don’t soak my pots, I just wipe teak oil on. I put it on pretty thick and you will notice on the end grain it soaks in real quick, I add more to those areas and add to the rest where needed for 15 minutes or so. I use an old cotton tee shirt cut up into about 3” x 3” pieces. When you are all done make sure to wipe the excess off because it will get real blotchy if you don’t, then I let it dry overnight. The next day inspect it too see if you need to add more, I usually need to add more on the end grain areas and sometimes this process takes a couple oiling sessions. After your final oil I give it a couple days to dry thoroughly before I start glueing. You will probably get a few other suggestions, this is just the way I do mine. Have fun experimenting. If it doesn’t work it’s not a failure it’s a learning experience, be prepared for lots of learning experiences. One caution, Oily rags are a fire hazard. Spread them out "outside" to dry. For soaking, I got a gallon paint bucket and dumped in a bottle of teak oil and use a clothes hanger to dip the call and hammer on the lid when I'm done. Let the call drip for 15-30 minutes then wipe the excess off and let it dry. Majordog is right, glass is a great surface in padauk, but i always do glass over slate. Zebrawood is similar to padauk IMO...glass over slate is very nice. For copper, I made one over glass and it was ok, but copper is a different beast. I haven't been interested in wasting the wood on copper since. no stranger to oily rag issues. personally I bag them in a ziplock, squeeze the air out, and add them to my metal bucket till its full. never had a fire. Really liking the paint bucket idea... going to pick up an empty and I guess I need to build a quick drying cabinet to keep the dust off while drying on the final coat. still way to cold here to stain, so got time. I was going to do the copper originally in the padauk but I think it will end up in the mahogany or the ziricote. Bought a cheap cabinet from the local big box store, put a light bulb in the bottom and use it to store my call blanks. It makes a huge difference using dry wood. Also is useful for drying the call finish. FDR, would you mind terribly if I asked for a pic of your cabinet? Curious as to the bulb layout, size, ventilation, etc. Sounds like a great idea. Here is a picture of my cabinet. The bulb is 25 watts and the shelves have a 1 inch space at the back to allow the warm air to rise in the cabinet. Click the picture to make it larger. that looks great. I have a garage full of unused cabinets from an apartment complex remodel... I might work one of them into the shop. I spent my coffee time this morning with google. Apparently you can use a large cabinet, think kitchen bottom, and you can put smallish air filters 10x10 on each side, with a pc fan on one blowing out. the addition of the bulb in the bottom would be icing. Thanks for the image though. I have several shallow uppers that I can make blank storage from, I hadn't thought to organize them that well. That cabinet has been in place for over 20 years with no discoloration on the bottom of the shelf above the bulb. As long as you keep the bulb wattage low you are good to go. Another safe option would be a "golden rod" heater unit like is used in a gun safe. I actually keep some of my more expensive call blanks on the top shelf of my gun safe. Works fine also. 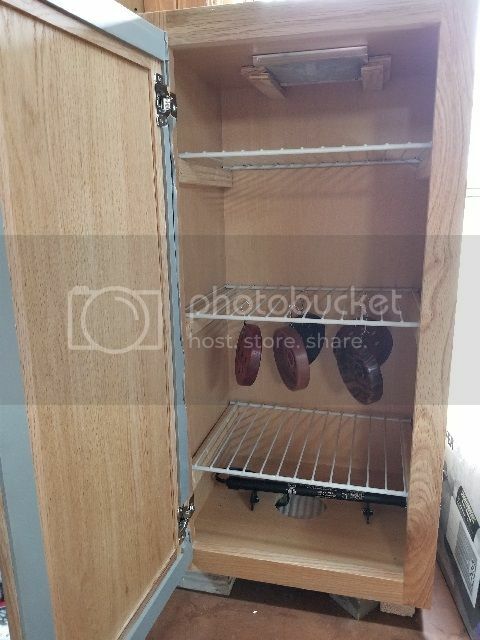 your inspiration led to searching for other plans for the 'cabinet' and I found this. Pretty nice stock finishing cabinet with the golden rod and two vents for flow. I don't see why this couldn't be adapted to have multiple wire shelves... I do a lot of finish work for the wifes projects and I think this will a project for this week. I'll let ya know how it works out. Prototype one will be unpainted due to weather, but I think later finishing can still work. So I got the cabinet finished up, sanded some pots and have done 3 pore sealing wet sands so far... The cabinet is working like a champ even in this 30 degree weather. It is raining today so yesterdays wetsand is still a bit damp. Will have to sand tomorrow now. Anyway, wanted to share the image for those that need a dedicated drying space. The link above is the source for the idea. I used some fishing hooks and a piece of bent wire to hold the pots onto the shelves. At 43 degrees outside temp, teak oil initial soaking took two days to dry to no scent. I'd say that works just fine. Lots of finish sanding and buffing over the next week before I can get to glue up...looking forward to season opener.